Description: Manuscript. Signature of Ni`matu’lláh Saffár at the end of section, pp. 1-109; then writing changes; further change of writing at p. 213. 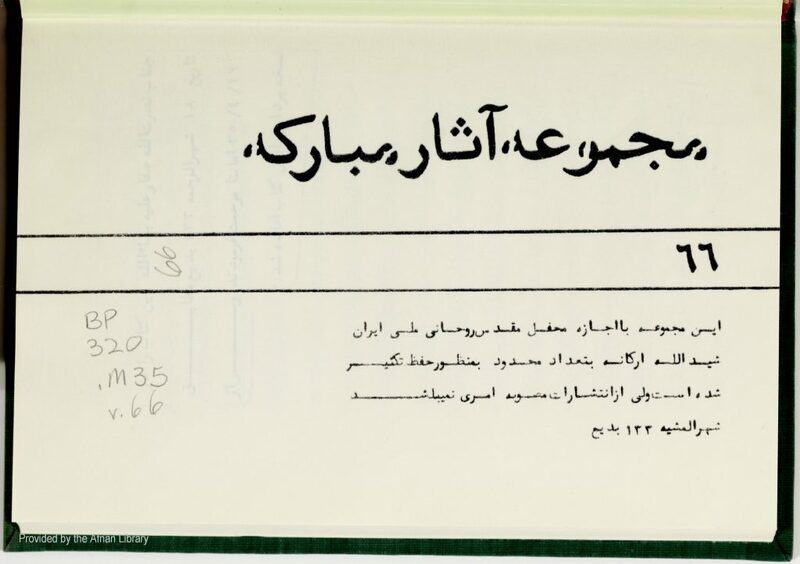 Includes Lawh-i Húriyyih (p. 4), Jawáhiru’l-Asrár (Javáhiru’l-Asrár, p. 36), Súratu’l-Hajj (Baghdad, p. 12), Qasídih `Izz Warqá’iyyih (p. 175), Lawh-i Húriyyih (p. 207), Risálih-yi Su’ál va Javáb (p. 213). Manuscript. 242 pp. of ms. (246 pp. of PDF).